Hope all is going well! Today’s post is going to be short and sweet life has been so busy latley. I am just glad I have still found time to workout. The days I dont workout I feel like I have no energy its the weirdest thing. Same thing with yoga I need to get that in otherwise I feel like my whole day is off. Speaking of working out have you heard of that IT WORKS company? They have a body wrap that sounds too good to be true, with Summer here its the perfect thing to use before you hit the pool. Its called the ultimate body applicator, its a non-woven cloth wrap that is infused with a powerful, botanically based formula to deliver maximum tightening, toning, and firming results in as little as 45 minutes. It continuously hydrates for firmer, smoother, more youthful-looking skin, and reduces the appearance of cellulite and loose skin. You guys should try it out here! let me know what you think! Thanks for stopping by, love you all! Love this whole look and the background is so cool! 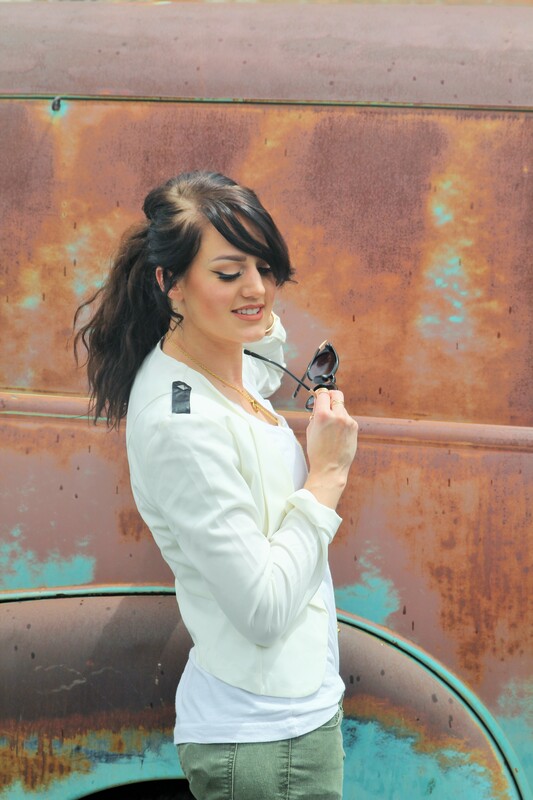 I love the little black leather details on the shoulders of that blazer! Love the jeans! Awesome color! Cute and chic look! Love your sunnies! Fantastica amo il tuo look!! I love the photo first of all, really cute dress love how you style it and nice blazer! 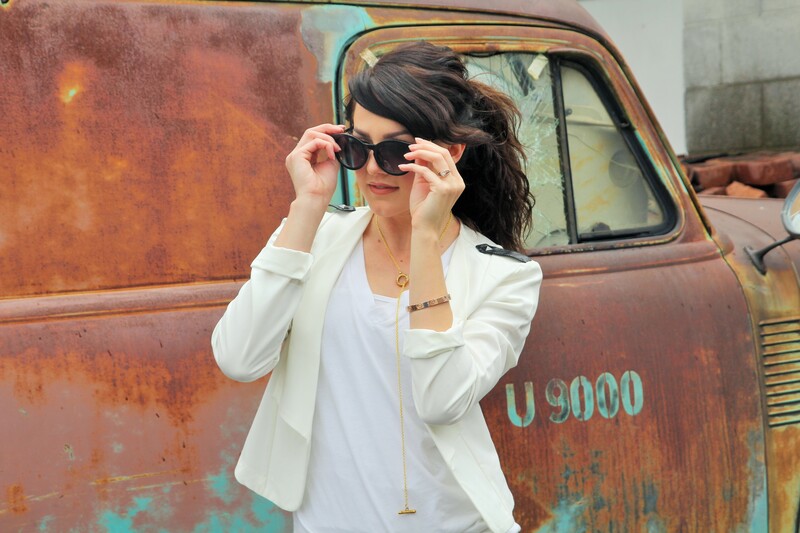 i blog about jewelry and how to style it with different outfits. thanks babe! Ahhh you totally should, there is way more to yoga then I ever thought, now I cant live without it! Love this look! Your booties are adorable! I like that olive color and I really love that necklace. I’d throw that on with everything! I know I really do LOL thanks for stopping by love! I LOVE this combo and you look beautiful!! You have totally inspired me to hunt down olive pants! You look beautiful! I’m loving the olive skinnies and the booties, love, love love! 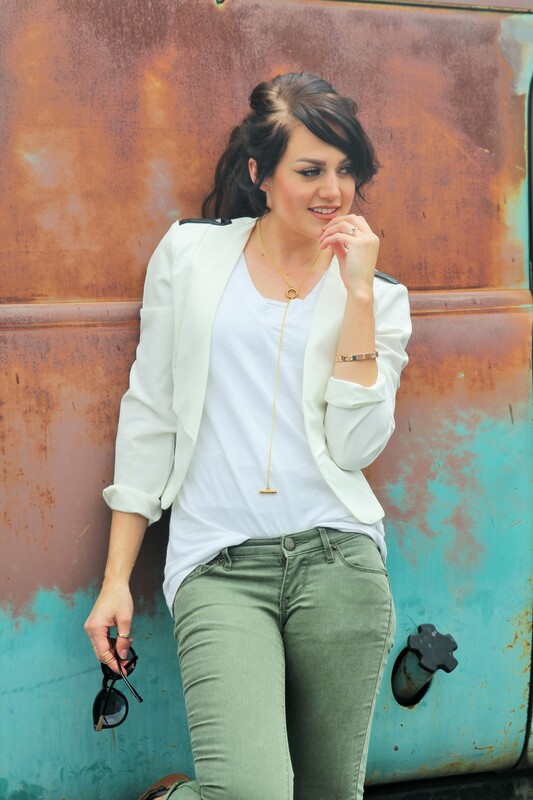 You rock olive skinnies like nobodies business! Fabulous and all the cuteness wrapped up in one great outfit!!! Thank you Andrea so sweet! So nice- love the colors ! You’re so pretty and I love this outfit on you! Those jeans and boots are just perfect!!!!! LOVE LOVE LOVE these pants. They fit you flawlessly too! Love everything about this outfit, especially the details on the blazer and that necklace. Oh, I love the green tint of the blazer, it looks wonderful, and you look great, too! Your booties are so cute! Great outfit ! You look so pretty and chic ! Great look! I love those olive skinnies! 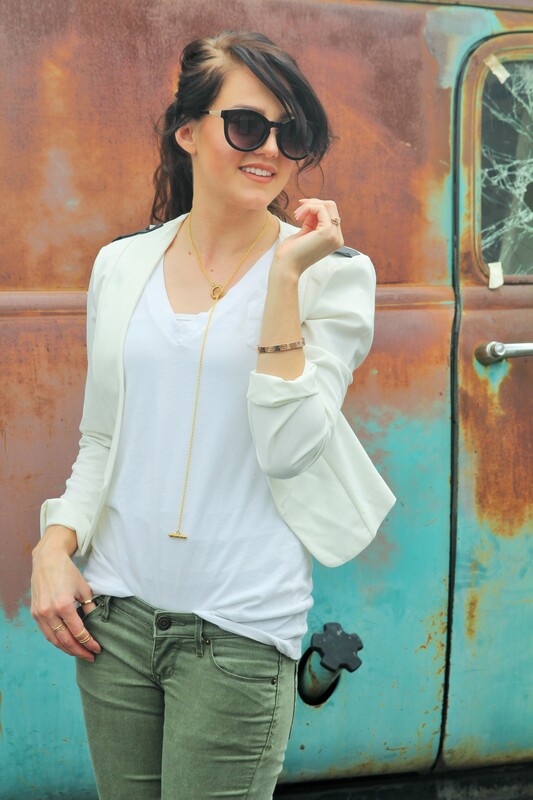 Love the white blazer and olive skinny!! And the necklace is lookin so chic~~ u look fabulous. 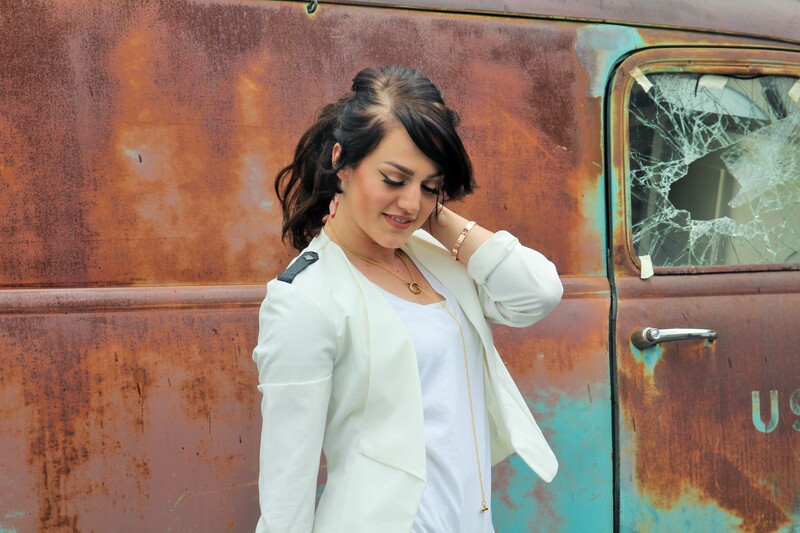 I loved the blazer and the skinnies, I think they match so well together and you look fabulous! I need to read your words again, so to start my day working out (I confess that’s not my cup of tea), it will certainly help me in many areas! I loooved your boots! This is such a cute look! I love the pants and boots combination! And the jacket is so cute you look amazing! Love the colors in this look and what a great background! Am I pathetic for wanting every single thing you are wearing? That necklace is so unique–I love it. The whole combination is awesome. You look amazing! You look gorgeous!! This location is so good, I want to take photos there! Love the color of those pants. I also like to combine olive with white. Gorgeous look, Jenessa! 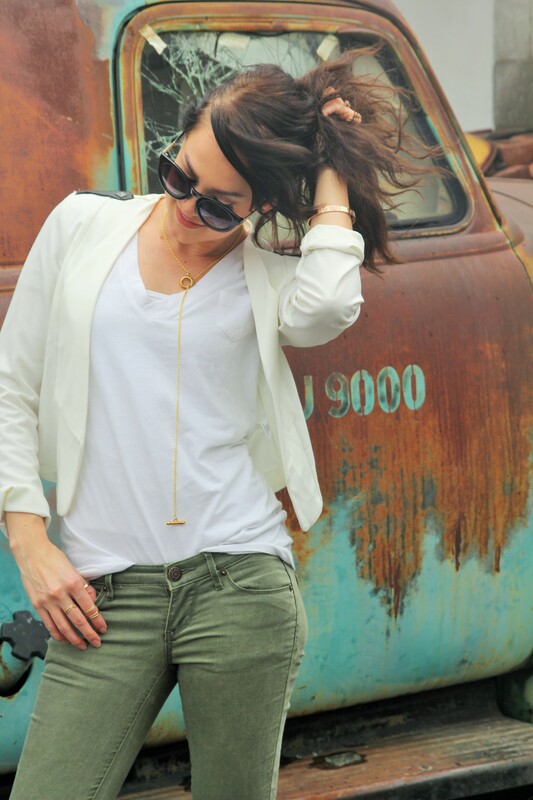 White blazers are so chic and I love how you paired yours with the olive skinnies! Hey cutie! Love this outfit. The pants are awesome! Thank you for stopping by SLS 🙂 Have a great weekend. nice casual look, love the olive color pants! Love the white blazer paired with those trousers! So pretty! Great outfit. It’s so classy!